Get Professional Assistance Completing All kinds of London Odd Jobs! No matter what sort of Do It Yourself, home repair or maintenance task you need help with, you can rely on us to provide professional and efficient assistance for all manner of odd jobs in London. We have a team of highly trained maintenance technicians at our disposal, each of whom has a broad skill set, and the years of industry experience that mean there’s no task or situation they won’t have encountered before. You’ll get precise help with whatever job you need to complete, either around your home or place of business! London odd jobs are easy for our expert team. With their experience and top of the range tools and equipment, there really is no better choice in the local area. From fitting a new light bulb to fixture repairs, re-painting to plumbing maintenance, our team does it all with professionalism and skill. In addition, each of our neatly turned-out handymen has undergone a strict vetting procedure and is fully insured, so you can relax when allowing our trained team into your home. 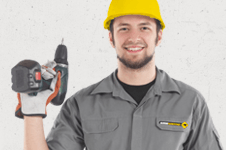 Why Hire a London Odd Jobs Handyman from Us? 24-hour per day customer support: 24/7 support cover is what we offer! Call or type in at any time. A variety of booking slots: make that appointment for a time in the early morning or late evening with zero hassle! Solid reviews: check out the testimonials our previous customers have left for us, over on our reviews page. Call 020 3746 0607 now and we'll be able to get started making all the arrangements for your appointment with our London odd jobs handyman services. Alternatively, you can use our instant web chat support facility or our online booking form to get in touch with us. All of our customer support features are fully staffed 24 hours a day, 7 days a week, so feel free to call or type in at any time. We'll be happy to give you a free, no-obligation quote on our services, and our advisory team will be able to answer any questions that you might have. When you call to hire help with odd jobs in London it's worth remembering that we've got a great selection of other services too, including options for home refurbishment and water damage repair!